Sky News:– A father was separated from his baby after getting off a train to have a cigarette, leaving the child behind. 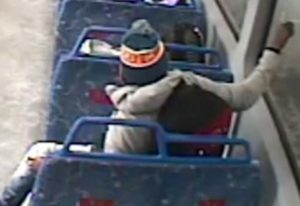 CCTV footage from the Greater Cleveland Regional Transit Authority in Ohio captured the incident which happened on 12 January. The father is seen standing up after setting the baby carrier on the seat, adjusting the baby, looking around and then leaving the baby unattended. When the train prepares to leave the platform, a fellow passenger realises the baby’s father is still outside and jumps up to alert him but he reaches the door a second after it closes. The father is seen trying to keep up with the train before giving up.